I wrote this piece for nywiciNEXT, the New York Women in Communications, Inc. student blog. 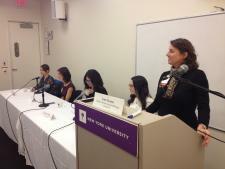 I had an awesome time organizing this panel for the 2013 Student Communications Career Conference. I was so impressed with the way the panelists wove their unique roles (editor, writer, community manager) into their responses to provide a truly valuable look at the blogging industry. We always hear that a blog is a strategic extension of a personal brand. It’s an asset to a portfolio or website, and a great way to get our writing out in the wild. But sometimes, we want to take our blogs to the next level. Whether we simply want to increase traffic and reach more people, or even turn our blogs into a full-time business, it takes strategic thinking and a commitment to consistently publish quality work. Be genuine. “The most effective posts have an authentic narrative,” said Liz Perle, Senior Editor at Huffington Post Teen. “If a post isn’t genuine, readers can smell it from a mile away.” She cited a post written by a HuffPost Teen contributor that simply expressed her admiration for Michelle Obama. It was honest and thoughtful, and caught the attention of the First Lady herself. This led to an opportunity for the young blogger to meet her idol at an event. The takeaway? Write openly and genuinely about things you actually care about and readers will notice and appreciate you for it. Find your people. Sure, you’ve got a lot to share on your blog. Who do you share it with? “The communities are already out there. You just have to go out and find them,” said social journalist and community manager Annemarie Dooling. She recommended strategically choosing a blogging platform based on your interest. For example, for photography bloggers, Tumblr lends itself well to posts focused on visuals. Chances are, other photographers have the same idea. Find them and reach out. Look at the numbers. Be sure that your blog has some form of analytics installed. It’s an easy way to see who you’re reaching and how they’re interacting with your site. “Spend some time with your analytics,” saidCarly Heitlinger, who founded TheCollegePrepster.com. “Follow the path of the user and see where and when they’re clicking.” She emphasized that making informed decisions about your site’s layout or user experience based on your analytics could have a tremendous impact on traffic. Become an expert in something. “When you have a blog, you become a source for other people in your industry,” said Jeannine Morris, Founder of BeautySweetSpot.com. How did Jeannine become an expert in her field? She worked on the beauty section of Cosmopolitan before launching her blog and learned everything she could about the beauty industry. She built credibility and quickly started seeing other blogs and publications linking to her site as a source. “When you brand your platform, you brand yourself,” she added. Take it to the next level. Focus on content first before turning your blog into a revenue stream and accepting sponsorships, partnerships, and running banner ads. Great content draws engaged readers, and once you build a following, you can consider turning your blog into a full-time job. “Consistency is more important than frequency,” Carly said. Be prepared to deliver on what you say you will, especially when it comes to sponsors. Everyone can have a voice online and a space to share their ideas; a blog is the perfect way to share yours.